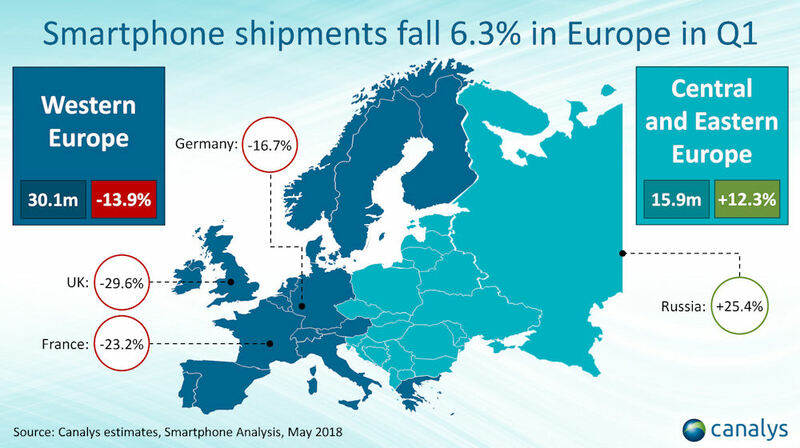 Overall European smartphone shipments fell 6.3% year-on-year according to Canalys’ research, but it was very much a game of two halves, with Eastern Europe growing by 12.3%, driven largely by Russia, while Western Europe fell off a cliff, down 13.9% annually. The overall drop for the continent was the biggest ever for a single quarter. 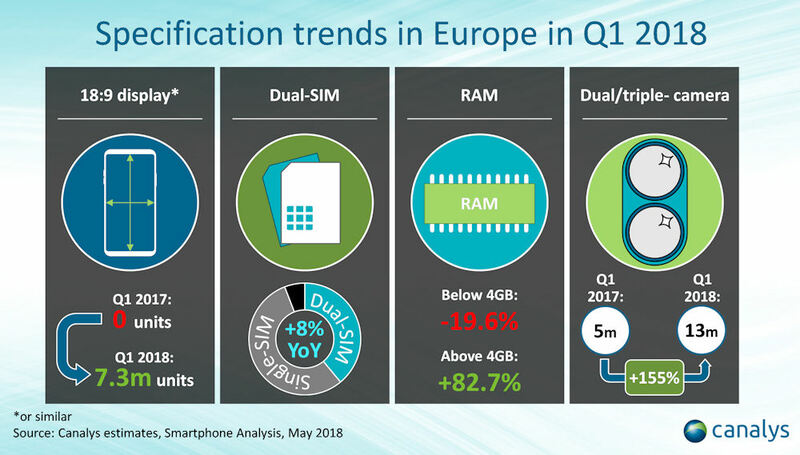 This would appear to mirror the broader global trend of consolidation in the smartphone market, with the top vendors gaining market share at the expense of the long tail. Samsung is the number one vendor but is having its own long tail attacked by Huawei and Xiaomi as cheaper phones increasingly offer much of the performance as flagship ones. “It is not all gloom for the smaller players,” said Lucio Chen of Canalys. 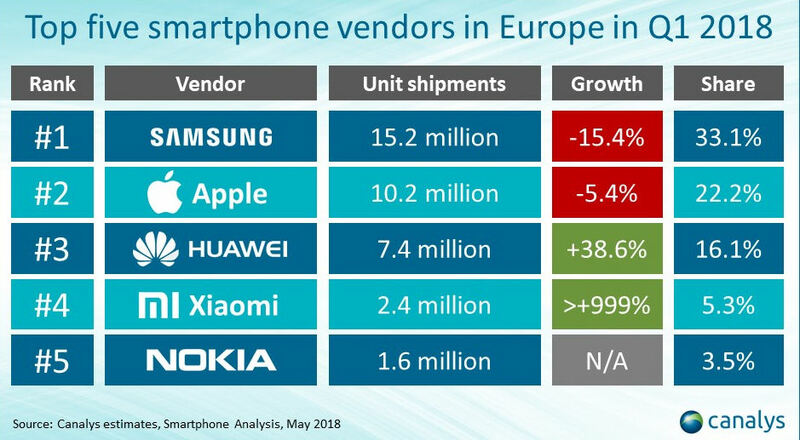 “Xiaomi and Nokia, under HMD Global, are both relatively new entrants to the European market, but have stormed to fourth and fifth place. “Xiaomi is working closely with distributors, such as Ingram Micro and ABC Data, to drive products into retail stores. HMD has taken a different approach, using its operator relationships on the feature phone side to get its new smartphones ranged across Europe. But both Xiaomi and HMD Global have the benefit of being privately owned. The nature of the component manufacturing business means that what used to be premium specs have become commoditised, which is the main reason for the shift towards cheaper phones even in rich countries. Now you can get a phone with a quality screen, camera, processor, etc for far less than the price of an iPhone X or whatever. The one vendor that seems to be impervious to the eddies and currents of smartphone fashion is Apple. While its brand is peerless, the fact that Apple has its own platform is probably the main reason it’s so much more resistant to commoditisation. When comparing Android devices specs are likely to be a more significant consideration then when choosing between Apple and Android. This is probably the main reason why Apple’s margins are so much higher too.